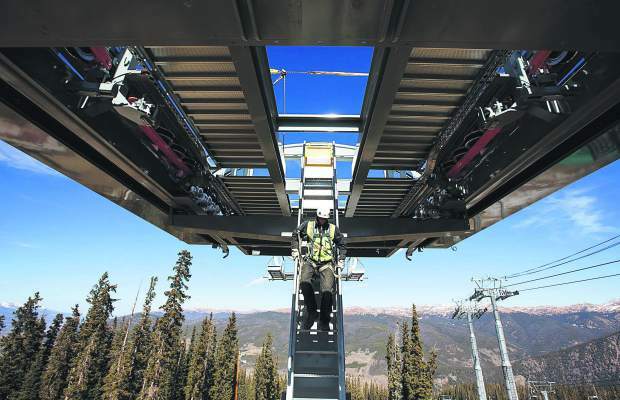 Keystone construction worker Eric Mills descends from the top terminal of Montezuma Express Lift Friday, Oct. 13, on Dercum Mountain at Keystone Ski Resort. 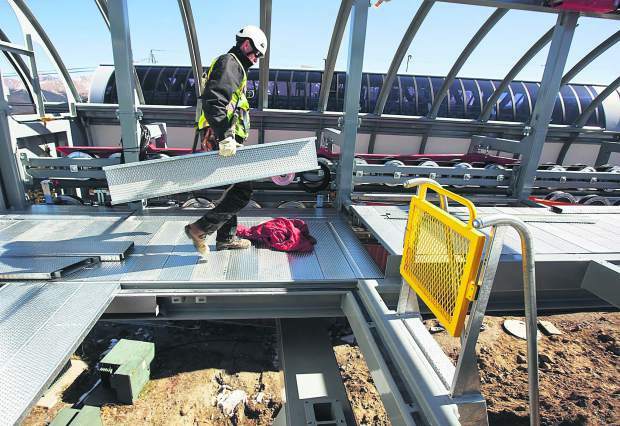 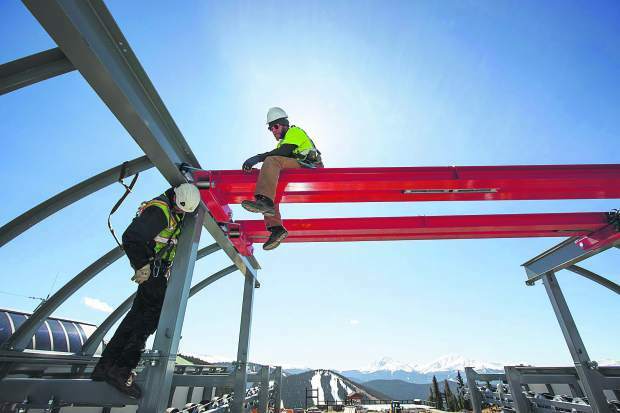 Keystone construction worker Eric Mills shifts metal planks from the top terminal of Montezuma Express Lift Friday, Oct. 13, on Dercum Mountain at Keystone Ski Resort. 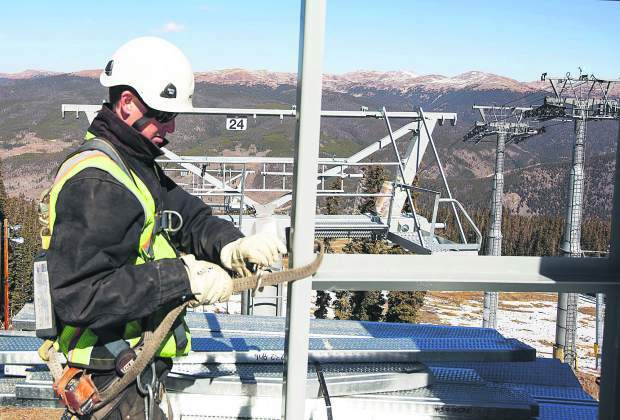 Keystone construction worker Eric Mills adjusts his harness and rope line to prevent from falling while working from the top terminal of Montezuma Express Lift Friday, Oct. 13, on Dercum Mountain at Keystone Ski Resort. 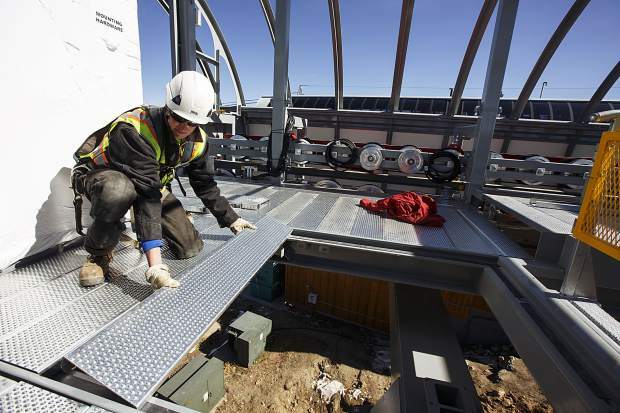 Constructio workers at the top terminal of Montezuma Express Lift Friday, Oct. 13, on Dercum Mountain at Keystone Ski Resort. 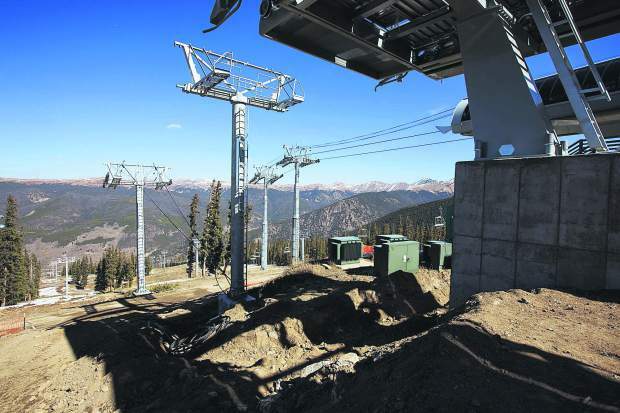 Brand new support towers leading between the Montezuma Express Lift terminals Friday, Oct. 13, on Dercum Mountain at Keystone Ski Resort. 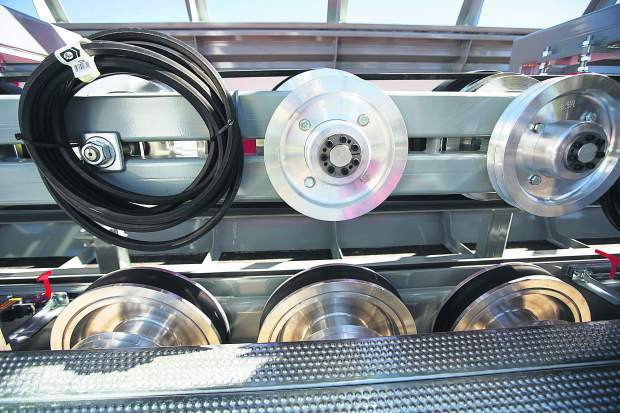 A series of sheave wheels, located on the crossarm of an in-line at the top terminal, Friday, Oct. 13, at Keystone Ski Resort. 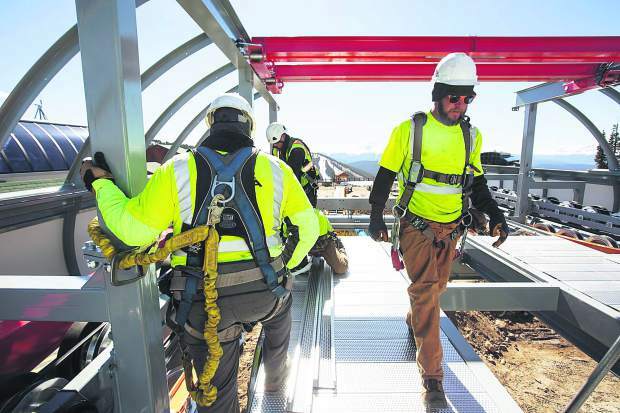 Keystone construction workers Eric Mills, left, and Andrew Lardin at work on the Montezuma Express Lift Friday, Oct. 13, on Dercum Mountain at Keystone Ski Resort. 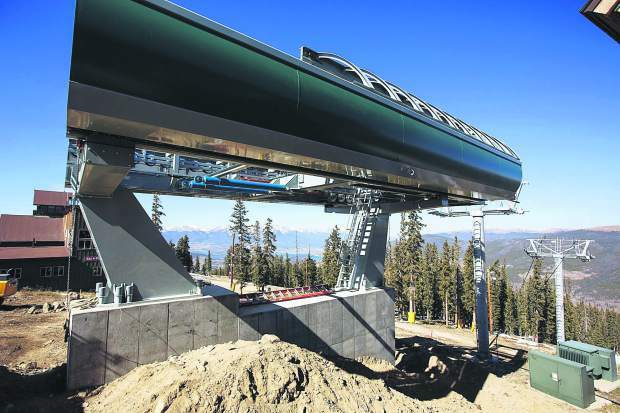 Top terminal of Montezuma Express Lift Friday, Oct. 13, on Dercum Mountain at Keystone Ski Resort. 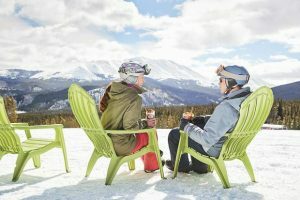 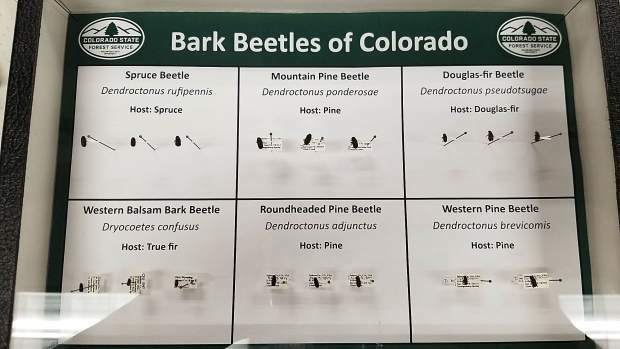 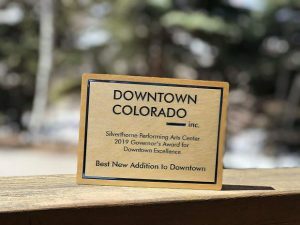 A new high-speed six-passenger lift on Dercum Mountain serving popular intermediate and beginner ski terrain was recently installed. 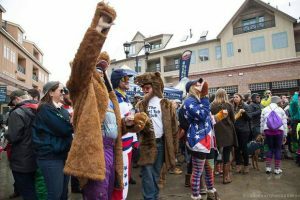 The lift will be open for the 2017-18 season with increased efficiency and capacity up 25 percent to improve the skier and snowboarder circulation on the mountain.